It has been said and said again, and you might be sick of hearing that cliché at this point. But I do feel like I have just been through a historical moment. One of those milestones that everyone has in their lives so they can say “Oh, yeah, I remember, that happened just before the assassination of JFK. That day, I was doing such and such”. In my life, there has been the death of lady Di, there has been 9/11… Now there is the election of Barack Obama. I was so happy last night to be in the Pacific time zone and to be able to live it live. I watched his victory speech, and the tears were running down my cheeks. I’m not even sure why. Because he is the first Black president and after studying the history of the United States rather extensively in University, I feel the signification of that milestone deep inside my bones? Because after 8 years of right-wing government I am hoping that the United States will finally take a turn for the better and regain some of their lost clout? Simply because Obama has amazing speech writers and knows how to deliver a speech flawlessly and pull on the hearstrings of all his over-sensitive viewers (which I know I am a part of)? I don’t know, and last night, really, I didn’t care. I know that Obama may not live up to our expectations. Who could? He was almost pictured as a demi-god. Nobody is perfect. But last night, I was just submerged in the moment and I celebrated with all Americans and, really, with the rest of the world. Here was hope, delivered on a platter. Here was the American dream. I know, it’s cheezy. But it’s still true. And I can just imagine what that victory must have been for those who worked so hard for it, those who fought for the rights of the Black people in the United States. Do you realize that it was only 50 years ago that Black people didn’t have the right to sit with White people pretty much anywhere? It wasn’t that long ago: a lot of those who fought for desegregation are still alive today. We saw Reverend Jesse Jackson crylast night, and I can just imagine all that must have been going in his head. And this morning, when they were playing Obama’s speech on the radio and everyone was chanting “Obama! Obama!”, our son started repeating “Mama! Mama!” Too cute. 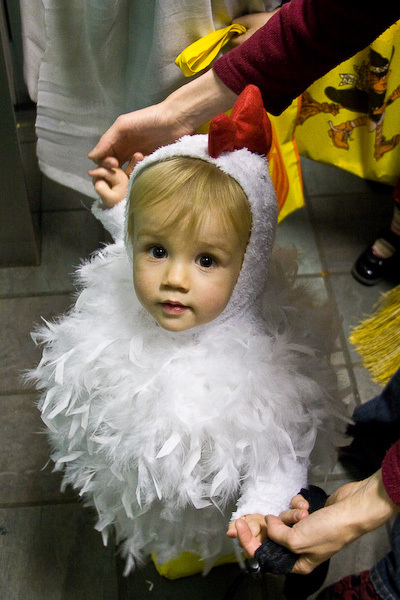 Isn’t this the cutest chicken you ever did see? I guess technically this wasn’t our son’s first Halloween, but since last year he was barely aware of his existence at this point, it doesn’t really count. So this year we went trick-or-treating to a few doors, and even though he won’t get to eat any of the things he collected, he discovered a very fun game: picking a candy and putting it in his bag. Knocking on the door was a lot of fun too, and when we gave up he kept pointing at other houses saying “door! door!” as to inform us that there were more doors we could go knock on. We had a great time with our neighbours, and our son’s costume was a big hit. Since it’s the first time I try my hand at such a crafty thing (we got the instructions for the costume on Martha Stewart’s Website, of all places), I have to say I’m rather proud of myself. Well, Zak did the shoes. And I didn’t have time to sow the feather boas onto the jacket, so if you saw the inside of it you would know that it’s covered in safety pins. But you won’t, so I can pretend that I did a great job!